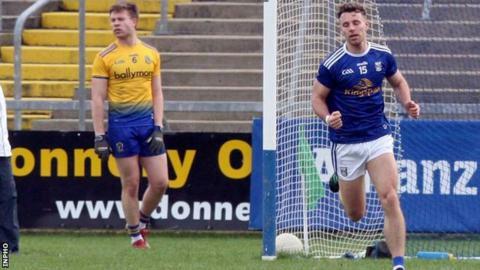 Cavan moved off the bottom of Division One of the Football League as they earned their first points with a superb 3-13 to 0-13 win over Roscommon. Despite playing against the breeze in the first half, Cavan led 1-7 to 0-8 at half-time after Conor Madden's goal just before the break. Roscommon fought back to lead by one but Madden's second goal restored a Cavan lead which they never lost. After Ultan Harney's Rossies red card, Martin Reilly hit a further Cavan goal. Points from Christopher Conroy, Niall Murray and Jack Brady helped the Breffnimen take an early 0-3 to 0-1 lead at Kingspan Breffni. Roscommon fought back to level at 0-4 to 0-4 before Cavan keeper Raymond Galligan made a great diving save to tip a goalbound Niall Kilroy effort over the bar. Darren O'Malley made another superb stop at the other end to keep out a Niall Clerkin shot but the Rossies custodian gifted the home side their first goal just before the break as his attempted short kickout was intercepted before Madden lashed the ball to the net. Points from Donie Smith, Cathal Gregg and Enda Smith put Roscommon one ahead after the restart but Cavan were back in front on 46 minutes as Madden netted his second goal. The house fell in on Roscommon's challenge after Harney's 50th-minute sending off. Two minutes later, Reilly's goal extended Cavan lead to 3-7 to 0-12 and the Breffni men hit six of the last seven scores to run out comfortable winners. Cavan remain in the relegation positions after the weekend action but their neighbours Monaghan now occupy bottom spot on score difference.